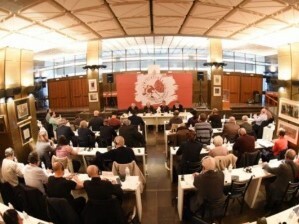 The plenary meeting of the European Communist Initiative was held in Athens on November 26. The European Communist Initiative (ECI) convened its plenary meeting in Athens on November 26. On behalf of the Communist Party of Greece, an introductory speech was made by Giorgos Marinos, member of the PB of the CC of the KKE. After the introduction, the rich action of the previous six months was treated, including numerous initiatives and interventions against the imperialist Euro-Atlantic plans and the further dangerous militarization of the EU; against the anti-communism of the EU and governments; against anti-popular measures like the orchestrated restriction of the right to strike and measures affecting the right to education; as well as activities for important anniversaries and celebrations such as the Great October Socialist Revolution, the May Day and the Anti-fascist Victory of the Peoples. In the name of the centennial of the foundation of the Communist International, the Communist Party of Turkey proposed to host an event in Istanbul in February, during which the CP’s participating in the Initiative will present estimations and conclusions on the major historical-political events of the 20th century regarding each of their countries. Moreover, it was decided to schedule protests in front of Polish embassies for condemning the new anti-communist trial against members and cadres of the Communist Party of Poland. In order to expand the Initiative beyond the borders of the European continent, representatives from the Socialist Movement of Kazakhstan, Communist Party of Mexico and Paraguayan Communist Party were also invited and participated in the plenary session. With the affiliation of the Communist Workers' Party of Finland for Peace and Socialism, the Initiative now consists of 30 Communist and Workers’ Parties.